Continued from Friday night in Santiago. When I woke the next morning in my bunk at the crowded albergue, I could not wait to pack up and move to the room I reserved at the Hospedería San Martín Pinario. 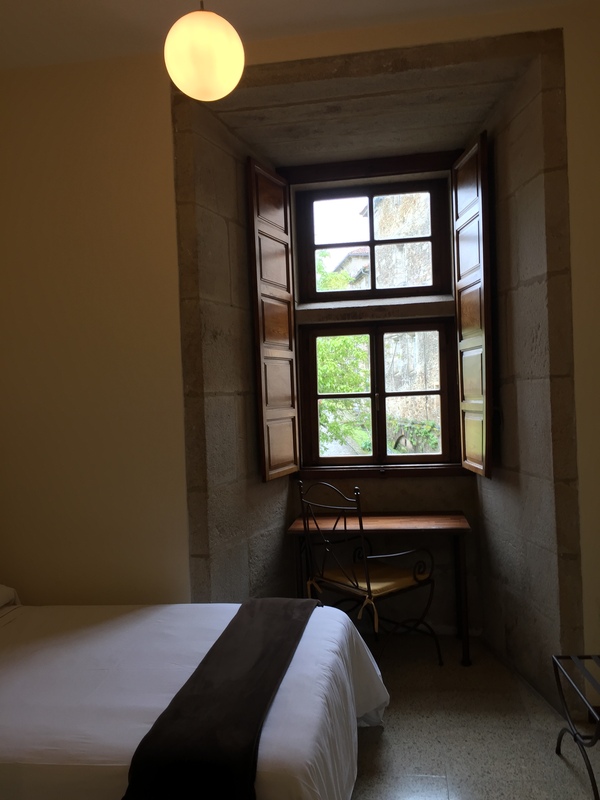 You never know how a place will be when you book online without seeing the rooms in person, but this place is listed in the Camino guidebooks, and all the reviews on booking.com were glowing (ranking: Fabulous 8.6, Location 9.7). They had me at fabulous! When I got there, I knew I made the right choice. It is adjacent to the cathedral’s side entrance, just around the corner from the stairwell that the opera singer performed in the day before. Location is everything! There is also something to be said for that feeling you get when you get to stay in a very special place—in this case a sixteenth-century monastery! Light, warmth, details. In Hospedería San Martín Pinario you can enjoy the unforgettable experience of living in a XVIth century monastery. Double & single rooms as well as accommodations for pilgrims. Varied solutions wisely recreated to give an unforgettable stay, however you want to experience Santiago. The calm of the cloister at sunset, read a book while sipping tea in the garden or enjoying a traditional ice cream in the reception hall, are some of different atmospheres that can be enjoyed in a place where every stone speaks of history. I checked in at the reception desk and was given a key to my private room. They were sold out of the pilgrim rooms, so I got a regular hotel room which is on a lower floor and supposedly has nicer furnishings. Compared to all the funky albergues I stayed at over the last seven nights, it felt so luxurious to have this space all to myself! I had a little desk at the window, and the view was lovely. My desk with a view. To me, this almost felt like staying in a Parador with its stone architecture, sparkling clean rooms, crisp linens, courtyard, and café. A continental breakfast buffet is included and there’s a three-course pilgrim dinner with wine for just ten Euros. 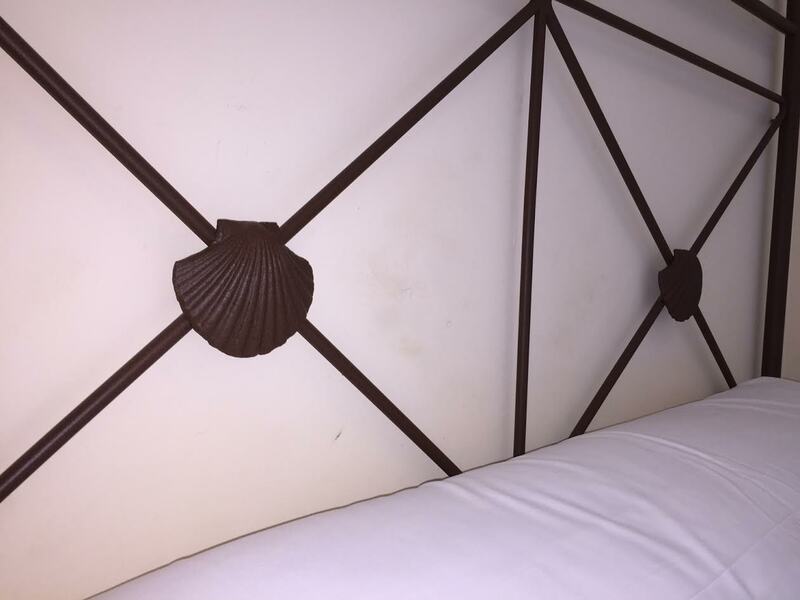 And if that weren’t enough, there were Camino shells on the bed! It is truly a paradise for pilgrims. What a luxury to have an ensuite bathroom with no wobbly sinks or wet floors. 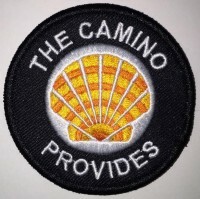 Everything was just perfect, and I was once again giddy with excitement, just like my first night on the Camino. I have recommended this place to friends and will definitely stay here for all my future Caminos. Savvy traveler tip: You don’t have to be a pilgrim to get 3 course dinner and you don’t even have to stay there. On my last night in Santiago, I brought two friends who stayed at different albergues. They never asked for our room numbers or checked credentials to see if we were really pilgrims. It gets a little noisy with the cavernous ceilings and all the wine drinking and groups of pilgrims celebrating, but it’s an experience! 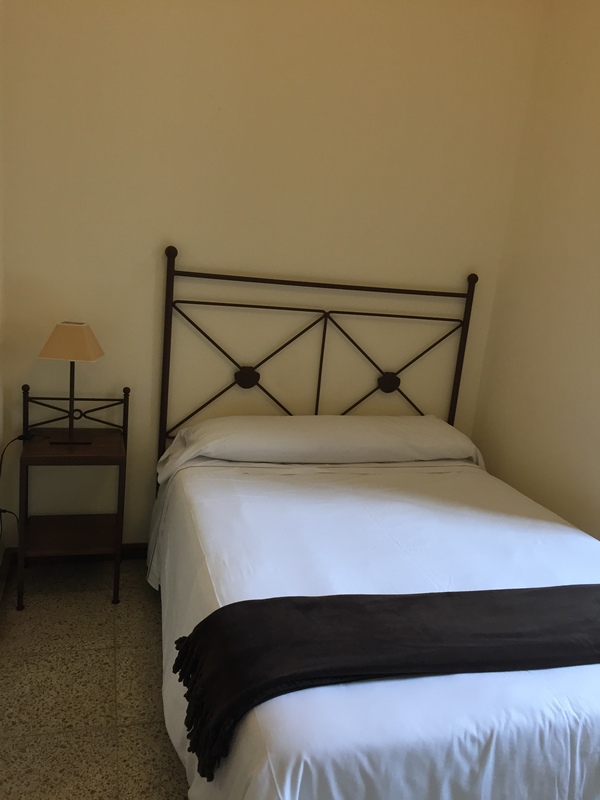 To book a room, visit Hospedería San Martín Pinario or Booking.com. Up next, the Free Walking Tour and Secretos de Galicia. I stayed at San Martin last July, also on the recommendation of a friend, and felt exactly the same. I actually began my Camino at the Basilica of St. Martin of Tours, in Tours, France so it was so wonderful to finish it at his monastery in Santiago! Wow, that’s very cool! Book-ending your Camino with St. Martin. Did you stay in a pilgrim room or hotel room? I’m curious about the pilgrim rooms. Hi Rosemary, Thank you so much! I’m glad you find the blog helpful. I look forward to catching up when you get back. Next May I’ll be taking a tour in France before my Camino Ingles so would love to chat about France. Vikas, thanks for the reblog. I’m following your blog now too. Any tips on traveling in northern India in December?